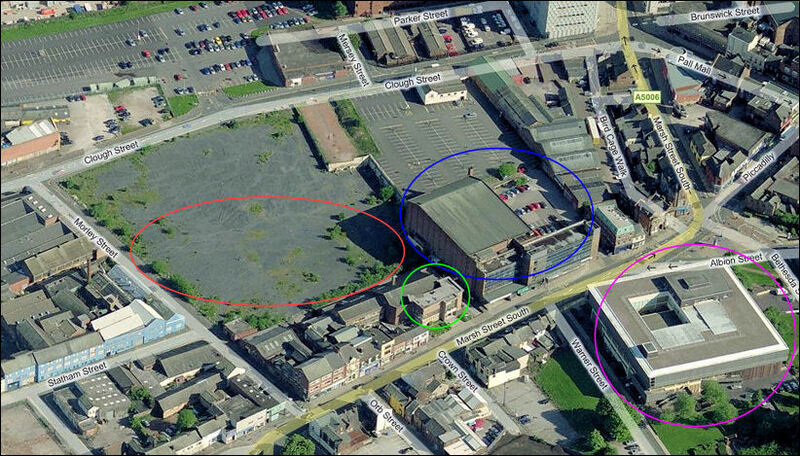 and continuing until 1998 - over 250 years of production at the one site. The works of John Astbury (d. 1743) is said to have passed to John Baddeley (d. 1772) and are identified with the pottery on the west side of High Street (now Broad Street), Shelton. 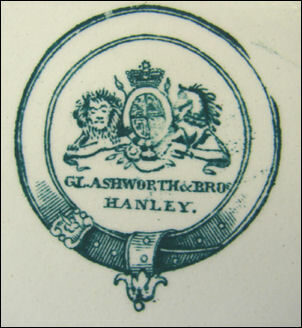 "Mr R Baddeley first made the Blue printed ware; and which subjected him and his brother to the highest censure for extravagance, in having a manufactory covered with tiles, instead of thatch; and for being the first who erected four hovels behind, instead of only two..."
After John died in 1772 the works were continued by Ralph and then from 1784 to 1806 by John & Edward Baddeley. 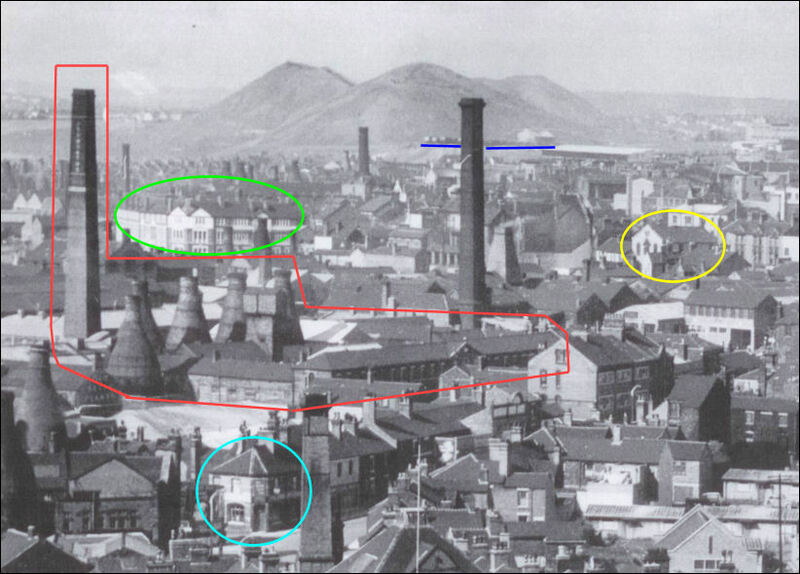 From 1806 to 1822 the works were operated by Hicks & Meigh. 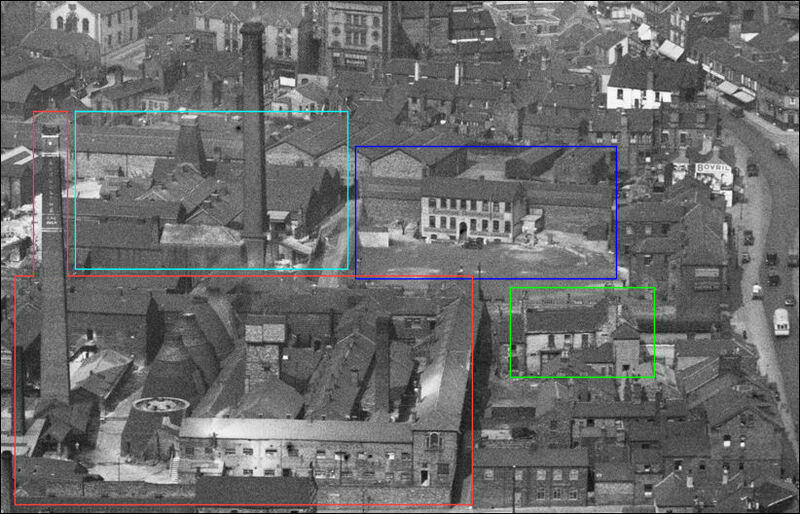 In 1815 they rebuilt the Broad Street works in a typical rectangular courtyard plan with the kilns in a line along the rear. 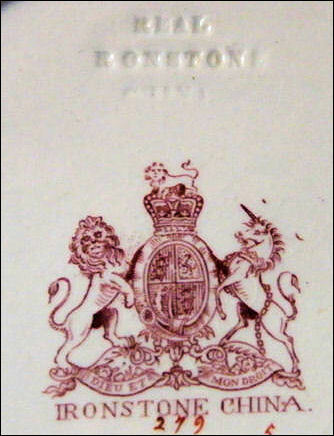 In about 1820 Thomas Johnson, their travelling representative, became a partner in the firm which was then known as Hicks, Meigh and Johnson. In 1833 there were 600 employees. 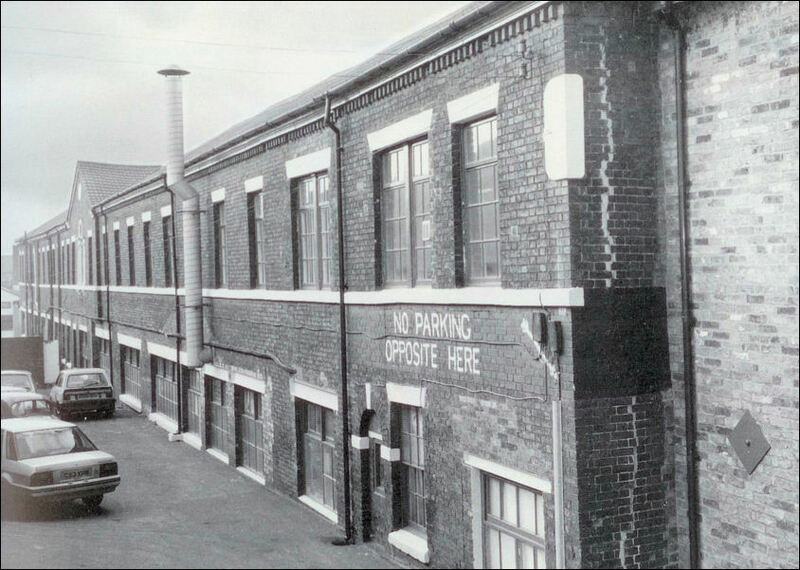 In 1835 the partnership was dissolved and the factory and its contents were put up for auction. 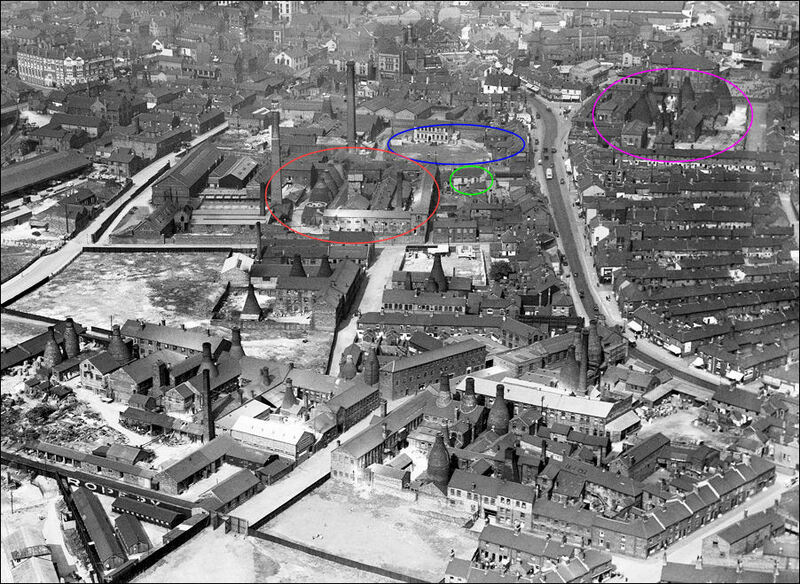 1836-42 the works was taken over by the partnership of Ridgway, Morley and Wear. 23 boys, 18 girls; under 13. 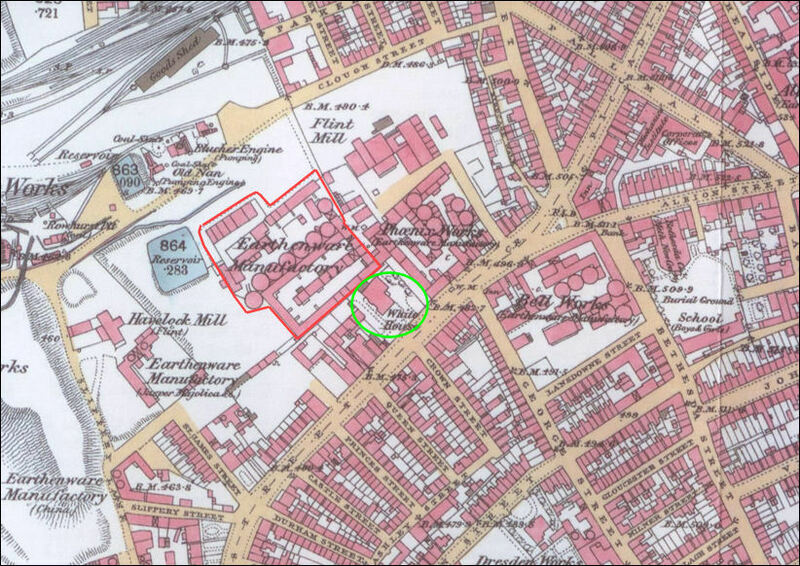 1842-44 the business continued as Ridgway & Morley. 1845-58 Francis Morley contined the business alone. 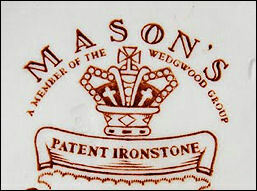 Francis Morley bought many of Charles Mason’s moulds when the latter went bankrupt in 1848, and established the Broad Street factory as the producer of Mason’s famous Ironstone China. 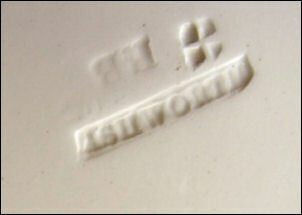 The works also continued producing earthenware. 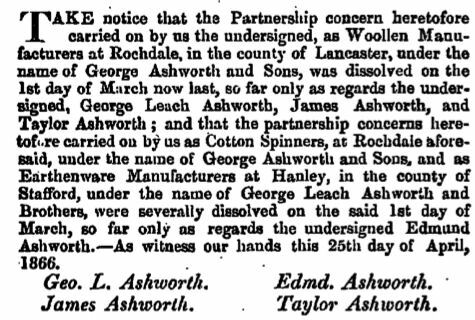 1859-62 Taylor Ashworth (youngest son of George Ashworth a cotton & wool mill owner from Rochdale) joined Francis Morley and the business continued as Morley & Ashworth. In 1862 Francis Morley retired from business and George Ashworth purshased the Broad Street pottery business for his four sons and continued the business as Geo. L. Ashworth & Bros. In 1883 the collapse of the woolen trade in Lancashire resulted in the Ashworth brothers selling the Broad Street business and it was purchased by John Hackett Goddard for his son John Shaw Goddard. By 1883 the partners were Mr. John S. Goddard and Mr. F. L. Johnson. 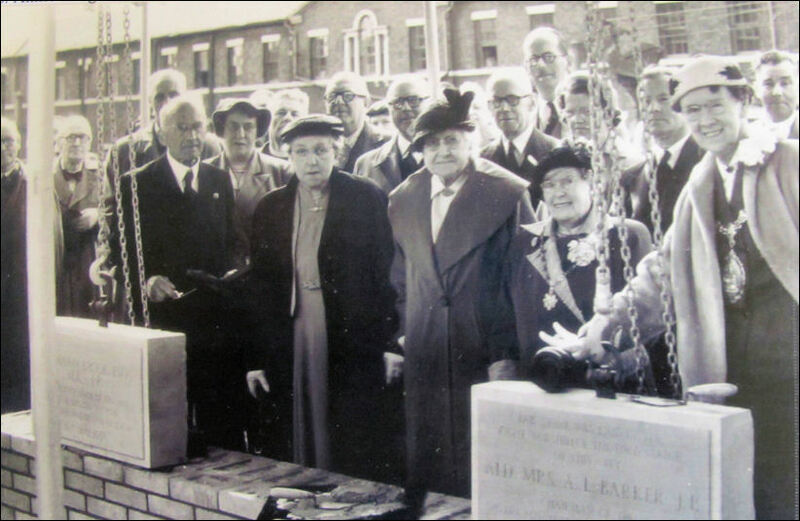 The business continued as a partnership of John Shaw Goddard & Charles Brock under the Geo. L. Ashworth name. 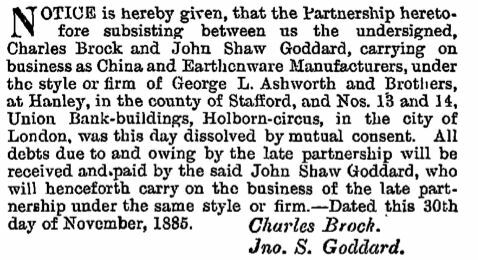 In November 1885 Brock left the partnership and it was continued by J. S. Goddard on his own. 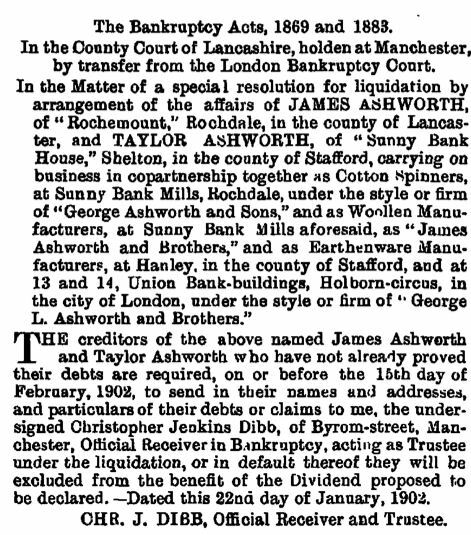 James & Taylor Ashworth must have retained some interest in the business as they were both declared bankrupt in January 1902. In 1973 the business was aquired by the Waterford-Wedgwood group, John Stringer Goddard retired in 1981. 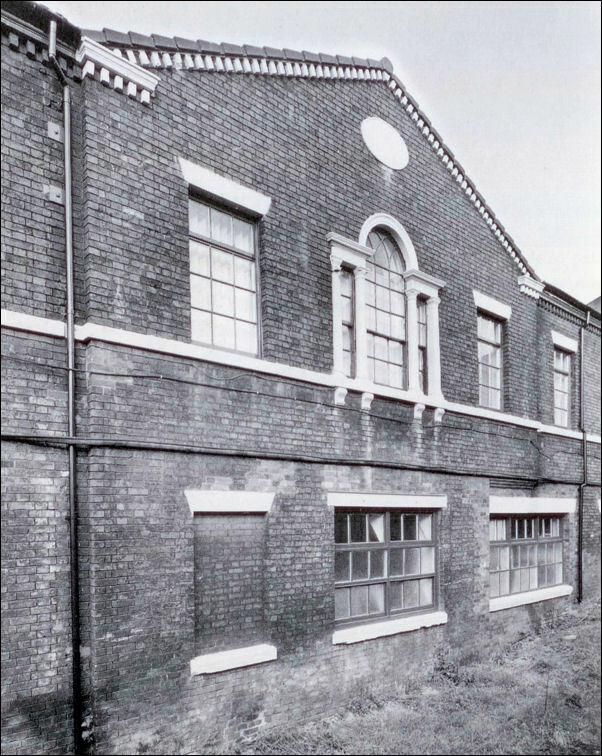 In 1998 production of Mason's Ironstone was transfered to Wedgwood's Barlaston factory and production at the Broad Street works ceased. The site was cleared in 1999. 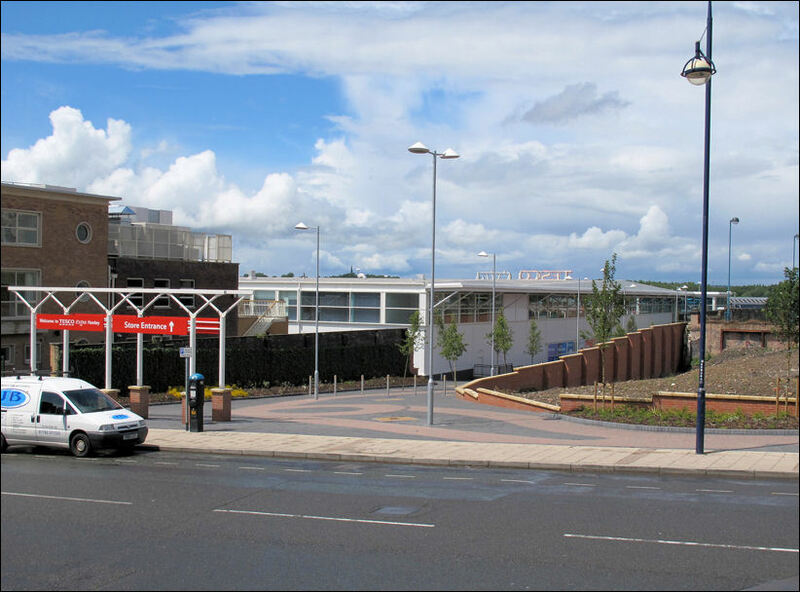 In 2010 a Tesco Supermarket was built on the site of the works. 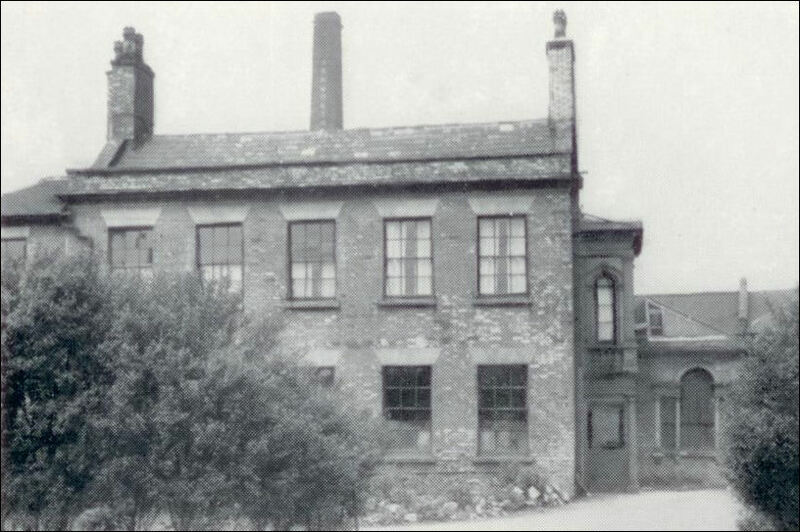 The White House fronting the Broad Street potworks was the home of Richard Hicks (of the partnership Hicks & Meigh). Later it was occupied by the dentist Crapper & Co. The White House was demolished after the Second World War and is now the site of the Mitchell Memorial Theatre in Broad Street. the business as they were both declared bankrupt in January 1902. 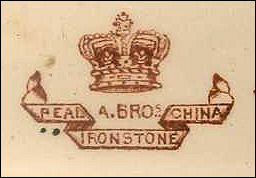 The ironstone, china and earthenware trades possess no better known names as manufacturers, than Messrs. George L. Ashworth and Brothers, of the Broad Street Works, Hanley, and it can be honestly stated that the productions of the firm are known in the leading markets throughout the civilised world. The foundation of the firm dates as far back as 1720, and as the firm grew older no single opportunity was lost in improving both productions and style. The firm at the present time give employment to a large number of workers. The present proprietors are Mr. John S. Goddard and Mr. F, L. Johnson, who still retain the old title, together with the old energy and enterprise. The London offices are at Hatton Garden, The factory, if permission be obtained to inspect it, provides a sight of a most interesting nature, the different intricate processes being gone through with a skill and certainly that is little short of marvellous. The firm are principally known for their exquisite productions from the designs of the late Mr. Charles Mason, whose name will long be remembered. 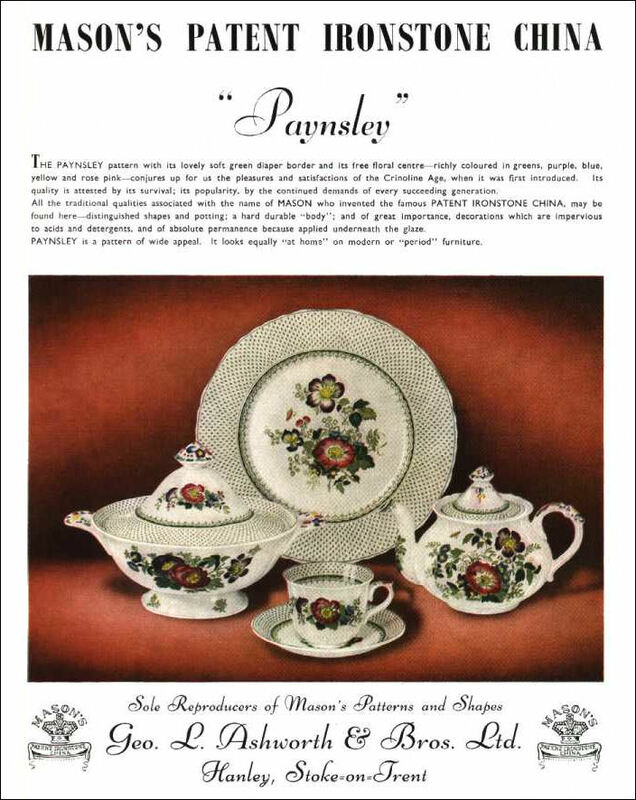 The firm purchased these designs and patterns from Mr. Mason, so that they are their exclusive property, and are used in the manufactore of dinner, tea and other services, Japan ware, domestic utensils, and a vast array of articles in ironstone and earthenware. For beauty and originality there is still nothing to beat them, and they are in greater demand than ever. A notable speciality owned by the firm is Goddard's "Simplex" patent cover. There has been a long felt want for a really good jug cover, which shall at the same time be simple, cheap to make, and automatic in its action. This cover the patentee claims to have all these qualifications, and to have advantages over any other cover for jugs made in pottery, which has hitherto been brought out. The feature of this cover is, that instead ol slots, holes are pierced through the sides of the top of the jug, and a spring made of special wire is bent into a half circle, and passes through two eyes in either side of the top of the cover, and so through the bole in the jug, and the cover opens and shuts by tilting forward or holding upright the jug. Two nibs or loops are bent in the wire opposite the eyes and holes in either side, and by the compression of the wire, by means of these, the wire can be withdrawn from the holes in the side of the jug, and the cover thus liberated, so that this cover has the following advantages : A jug can be used either with or without the cover. The act of pouring out the contents from a jug opens the cover. The cover cannot fall off, even if the jug is turned upside down. There is no liability of breakage at the points where the cover is attached. It therefore approaches as near as possible perfection, and is very largely in demand. The firm ranks high in the industrial world, and is worthy of the reputation it has so justly gained, and so long maintained. Geo. 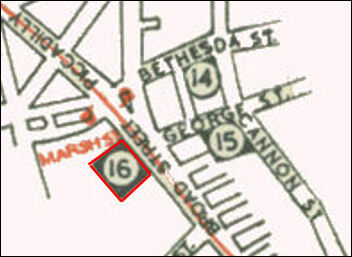 L. Ashworth & Bros. Ltd.
1956 article on Geo. 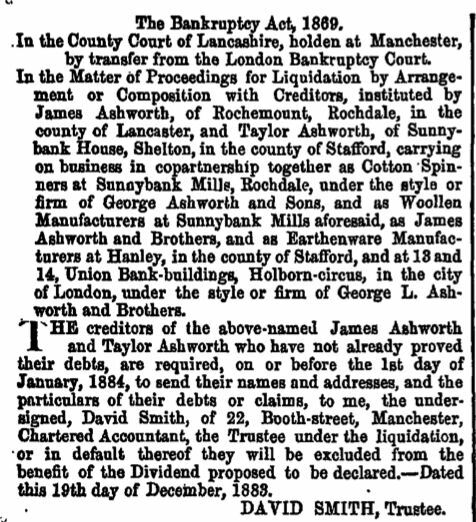 L. Ashworth & Bros Ltd.